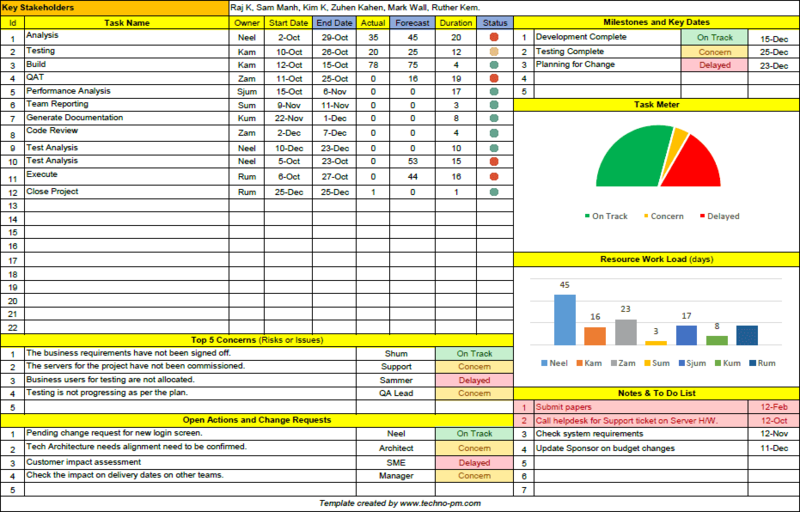 Using PowerPoint for project status reports gives additional flexibility to make the status report more informative. The PPT template has 4 key sections - Summary, Timeline, 4 basic parameters and risks/issues section. 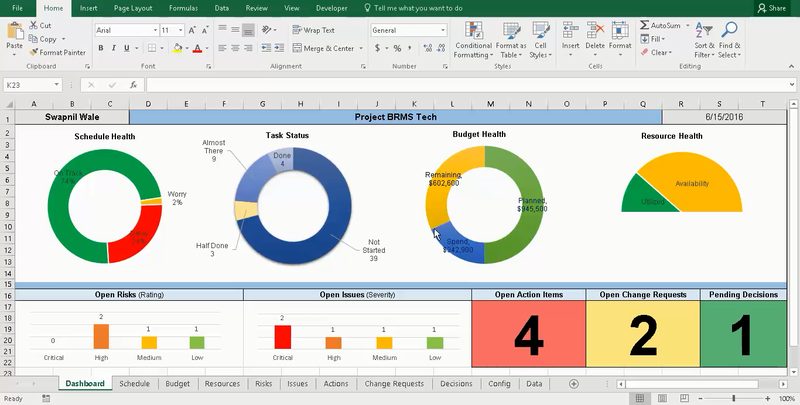 As it is made in powerpoint you can combine several projects status report into one presentation to report on multiple projects. The PowerPoint template has 4 sections which cover key project parameters like schedule, budget, risks, issues and benefits sections. 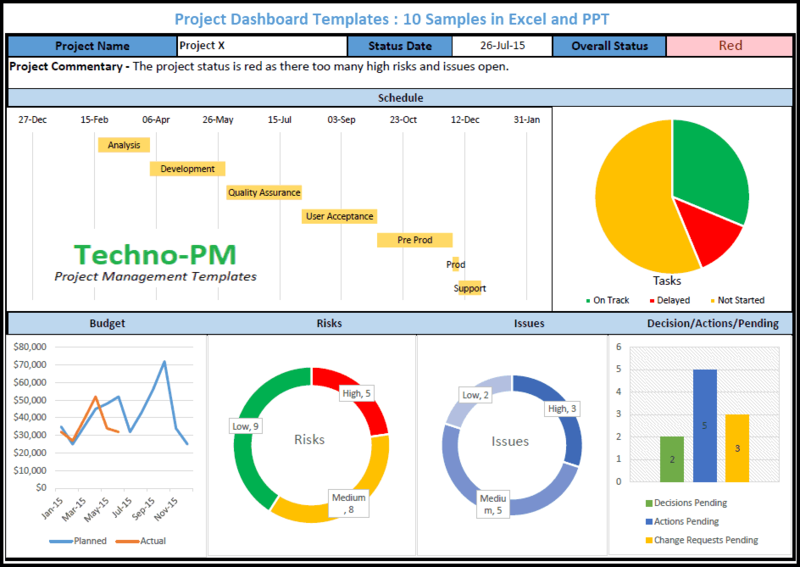 The template has a timeline section which can be used to visually report the status of the project. The timeline can be updated within the report as the project progresses. The timeline also has an option to display today's date. 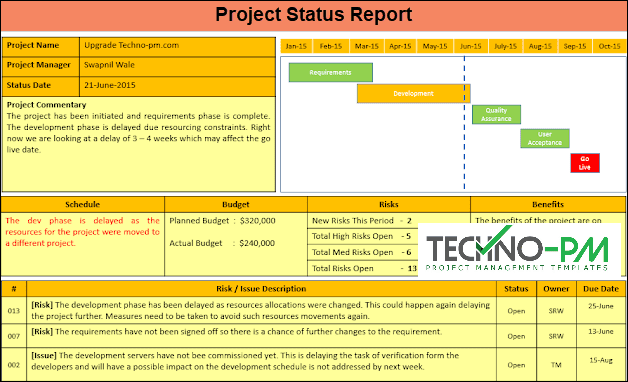 The template has a section for Project Summary which can be used to write a free-form update on the project status. Each of the key parameters - Schedule, Budget, Risks and Benefits have their own sections which can have custom information. Separate risks and issues section will highlight the top 3 risks or issues affecting the project. As it is made in power point you can combine several projects status report to report on multiple projects. The first section in the PPT template has Basic Information like project name, project manager name and status date. It also has a Project Commentary which is a free-form update of the project. It is key that the summary be short and crisp. The Project Timeline has a scale in months on the top which can be changed to suit individual needs. The timeline blocks or phases can be moved as per the detailed project schedule. So, if the project dates change the block can be moved back or forward. Depending on the status of the project phases the color should be changed. So, if the project phase is delayed then it should be marked in RED, if it is at risk then AMBER and GREEN if all is good. The blue dotted line can be used to indicate today's date. The blue dotted line gives everyone an idea about where we are in the project. Please note that the timeline should be used to give a rough idea about the schedule. Schedule can be used to give a quick update in the project schedule or detail key dates. Budget has planned budget and actual budget but additional details can be added. Risks details how many new risks we have open, how many high and medium risks and total risks open. The Benefits should indicate if the project benefits are on track. One way of indicating if there is an issue in an area of the project is to highlight the section in RED. In the below example I have highlighted the schedule section as the development is delayed. The project risks and issues detail the top 2 or 3 risks or issues affecting the project. The # or serial number is a number identifier for the risks or issue. Risks/Issue description should have a brief description. To start with [Risk] or [Issue] indicator will tell everyone if the item is a risk or issue. Status column indicates if the risk or issue is open or closed. The Owner is the column which should have the name of a person responsible for finding a resolution to the risk or issue. Due date is used to indicate by which date the risk or issue should be resolved. im trying to download the but cant download it. Just tried and it worked for me. Can you check if you are behind a firewall? Are you downloading from work? Is it possible if you could email to lizyounan@gmail.com?